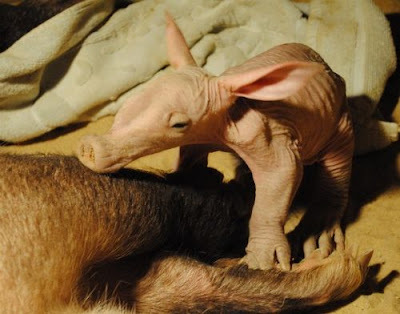 It's a baby aardvark! It's naked and wrinkly! It has a long snout with a piggy nose on the end! It has ears too big for its head! It's thin at one end, much much thicker in the middle, and thin again at the far end! From the Colchester Zoo thanks to Zooborns. Now why isn't there a movie starring this cutie? I'd go see it! It was called Star Wars and his name in it was Max Rebo. ugdorable is the perfect word! looks like he's made of clay! !